Feast. Beef brisket. Pickled vegetables. 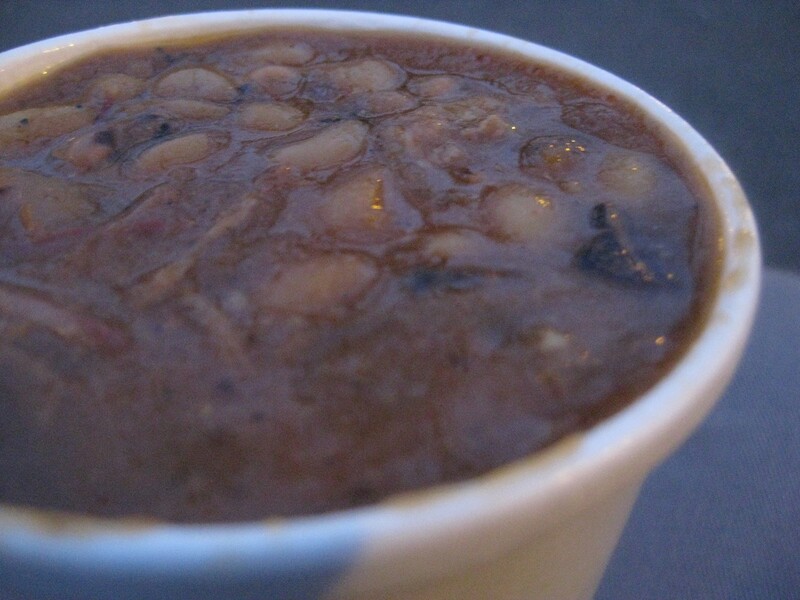 Burnt-end baked beans. I was pitifully, once again, under dressed for the weather of New York. I took my barbecue to go, since I wanted the experience of eating in the smoky air of the spring (extended winter). It turned out to be not too great of a decision, as it was freezing cold and the lighting was pretty bad. I most likely was burning the meal as I ate it. The brisket was less dry than I had anticipated, but I feel, for the most part, dryness is the norm with briskets. Most brisket that I’ve tried has this severe divide where there’s dry meat and then an entire section of melty fat. It’s like the cupcake effect, where you want a bite of frosting for every bready part of the cupcake, but its just not evenly distributed like that. So you cut the cupcake horizontally and flip the cap upside down so you can have a cupcake sandwich instead, or you break out the plates and full-on silverware so you can perform cupcake surgery and adequately redistribute frosting. Look at that burnt carbon just chillin' there. Sheesh. The same goes with brisket. I usually go with breaking out my silverware and proportioning out the fat and lean meat that I need to make each bite incredibly delicious. A small price to pay for good eats. 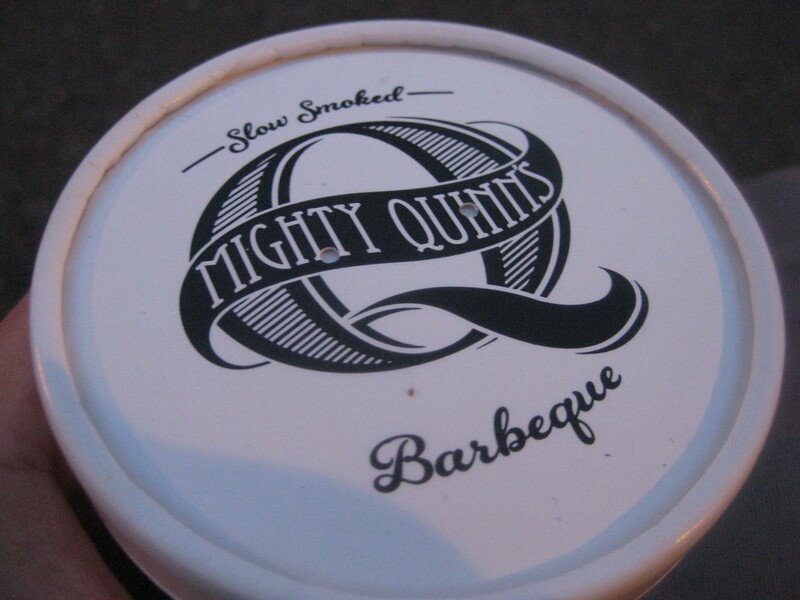 Other than the usual, complete mechanical failure, the brisket from Might Quinn’s was very smoky, which was to my liking. A dabble of smoke, chewy, but not dry, combined with some fat here and there…fine. A couple steps above average, M-Quinn. The burnt end baked beans were not as amazing as reviews reported; most of the burnt-end flavor seemed to be lost in the mess of beans. Burnt-end baked beans also has the potential to taste excessively burnt, given the quality of the ends you put in (I hope they’re not just putting in chunks of carbon…I get enough of that from my water filter). Since the barbecue was more than acceptable, I decided to focus this post on those pesky burnt-end beans. I suspect they used refried beans of some sort, added with liberal amounts of ends, brown sugar, vinegar, and cooked to a crusty, gooey, delicious mess. Before we continue, a firm (absolutely) understanding of burnt ends was wonderfully summarized by James Boo of Serious Eats. 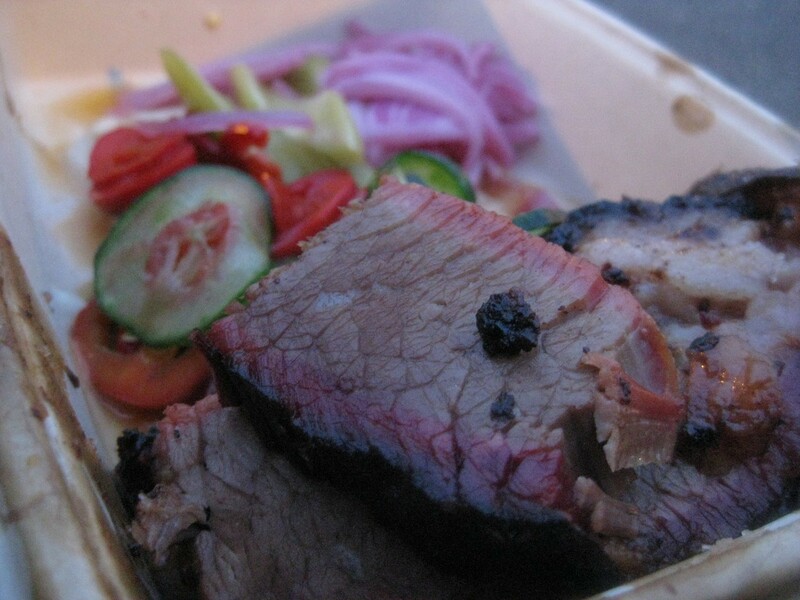 Mr. Boo quickly summarizes for us what the barbecue hype is about, funneling our way to where burnt ends are made. There are four “regions” of barbecue in the South. Texas. Known for smoked brisket. Memphis. Known for pork shoulder-ness. Carolinas. Hogs-only barbecue. Get that cow outta here. Burnt ends (essentially, no waste) are the oddly shaped bits that are cut off the ends of a beef brisket. Some of these ends can be extremely fatty, as some chefs decline serving them. These subsequent flavor powerhouses were thusly incorporated into other barbecue sides, adding a barbecue party to anything and everything served. They’re described as “gold nuggets,” “saturated by the taste of wood smoke,” “crisp,” “with a savory bark and succulent fat.” Geez. Forget the rest of the meal, just hand that over. The key is in the supreme caramelization the ends, which is so powerful that it resonates through the sweet, vinegary, and bold flavors of baked beans. It’s only a shame that someone figured this out and now is making bank on it, whereas they were probably handed out free at some point. It’s interesting to think about the statement that “bold, burnt end flavor cuts through the saucy baked beans.” It really makes me wonder where we’re at when it comes to discovering synergistic or cancelling flavor combinations. To some extent, it’s already happened, since we know combinations of foods that help open the palate or stomp undesirable unbalances. What about flavor cancellation? This could delve into the realm of what I call “timeline eating.” I describe it sort of like when tasting a sauce. I taste tomatoes first, then basil, a hint of olive oil, some parsley, some oregano…but what about the timing of those flavors? What happens if I wanted to taste something else first? When does that flavor leave and the other one come in? For burnt ends, I would want to begin with that flavor and end with the smooth sweetness of the saucy beans, not the other way around. But how would we do it the other way around? Is it critical to find a burnt end before a spoonful, or is there some way one can incorporate flavor timing regardless of the consumption of the item itself? All those questions are rhetorical. Kind of. I would think that this requires an in-depth understanding of multiple ingredients and their scientific properties. Smoke points, extraction amounts, chemical composition, competitive inhibition, allosteric effects, saturation, boiling points, etc. Perhaps recipes of the 22nd century will have exact times and temperatures to create “reproducible” meals. That is, after all, the goal of “recipes” right? Maybe not. These 22nd century recipes would not be recipes in the traditional sense, where one “bakes a chicken at 350.” I’m talking precision down to the microgram, consistent heat within Kelvins, and millisecond timing with the addition of ingredients, and perhaps, even the same precision when served and eaten. Surely, this is sounding more and more like creation of an artless, consistent TV dinner governed by an eating dictatorship. Hm. Food for thought?